Driving is an important means of personal travel in many countries including India. Visual functioning is central to successful driving. Visual functioning comprises different components of vision such as visual acuity, visual field, contrast sensitivity, and color vision, each of which has an important role in driving safety and performance. Vision requirements for driving vary in countries for licensing of drivers and license renewal. Most countries have specific requirements for visual acuity and visual field. The Indian Motor Vehicle Act (IMV) 1988, amended 2017, prescribes the guidelines for licensing in India. The Motor Vehicles (Amendment) Bill, passed in August 2016, did not include any further vision-specific criterion for driving license (DL) renewal in India and calls for a self-declaration (Form 1) and a medical certificate (Form 1A) for issuing license. Glaucoma affects the visual field, which is an important criterion for driving safety. Various studies have shown that drivers with glaucoma perceive greater difficulty with driving and this difficulty increases with the severity of visual field loss. Visual field loss severity is also associated with increased incidence of motor vehicle accidents.,, Drivers with glaucoma have also been shown to make more driving errors during driving simulator and on-road evaluation of driving. The prevalence of disease which could affect either visual acuity or visual field increases above the age of 40 years. The prevalence of primary open angle glaucoma (POAG) (age 40+) is 3.5% and primary angle closure glaucoma (PACG) 0.88% in the urban population in South India., The age of incidence of glaucoma coincides with the time of renewal of the license (20 years after first issuance, approximately age 40–50 years). Our study aims to collect the details of the DL renewal procedure (in an urban metro in India) among patients with diagnosed glaucoma, and in specific, the method of reporting of the vision-related requirements during renewal, to highlight the performance of the licensing process in the context of visual field loss in glaucoma. Patients with glaucoma were recruited from outpatient department of the glaucoma service in a tertiary care hospital situated in an urban metro. Patients were above 40 years of age with diagnosed glaucoma and were on treatment. Glaucoma was defined as diagnosed glaucomatous optic nerve head changes and corresponding visual field defects, which satisfied Anderson's criterion. All patients were having valid DL. Patients with best-corrected visual acuity less than or equal to 6/24 in both eyes and those having primary eye disorder other than glaucoma were excluded. The study adhered to the tenets of the Declaration of Helsinki; it was approved by institutional scientific and ethical committee. All participants were given a full explanation of the nature of the study and written informed consent was obtained. Demographic data and detailed history of patients were noted and eye examination was done, which included visual acuity by Snellen's chart, refraction, slit lamp bio-microscopy, applanation tonometry by Perkin's tonometer, gonioscopy by Zeiss four mirror lens, and dilated stereoscopic fundus examination and peripheral retinal examination. Visual fields were assessed monocularly in each eye using the Swedish Interactive Threshold Algorithm-Standard 24-2 threshold strategy on a Humphrey Field Analyzer (model 750, Carl Zeiss-Meditec, Dublin, CA). The monocular Humphrey Visual Field test (HVF) gives more specific information about the location and depth of the defects and, therefore, is the overwhelming method of choice for use in diagnostics. The binocular Humphrey Esterman Visual Field test seems not to be as efficient as the HVF in finding visual field defects in glaucoma patients and is therefore said to be of doubtful efficacy in evaluating visual capabilities in traffic situations. Monocular visual fields of both eyes were integrated for binocular results. Visual fields of the right and left eye were superimposed and the best threshold at each point from either eye was considered. at least 10 dB within a radius of 20° from the center of the visual field. Assessment of results was constituted as either “pass” or “fail,” if any of the above two criteria is not met. Visual Field Index (VFI) is a global index that assigns a number between 1% and 100% based on an aggregate percentage of visual function, with 100% being a perfect age-adjusted visual field. The VFI values were considered as continuous variables while studying the relation between visual field loss and driving difficulty scores, score of driving space, and occurrence of self-reported crashes and citations. Do you have a valid DL? Since when are you driving? Which type of vehicle do you drive? When did you get your DL last renewed? Did you submit a self-declaration form (Form 1) and medical certificate (Form 1A) when you applied for the renewal? Was mention made about your visual problem (glaucoma) in Form 1? If you have got the medical certificate of fitness, who was the undersigning doctor, an ophthalmologist, or any other registered medical practitioner (RMP)? Have you been checked for visual functions, namely, visual acuity or field or color vision by that doctor at that time? What other tests or examinations, if any, you had, to get the license issued? Did any road transport office (RTO) personnel help you in or offer you any bypass in the whole procedure? Anticipating 5% dropout rate, final sample size was determined to be 100. Statistical analysis was done using SPSS-20 and Fisher's exact test (modification of Chi-square test). P value <0.05% was considered statistically significant. 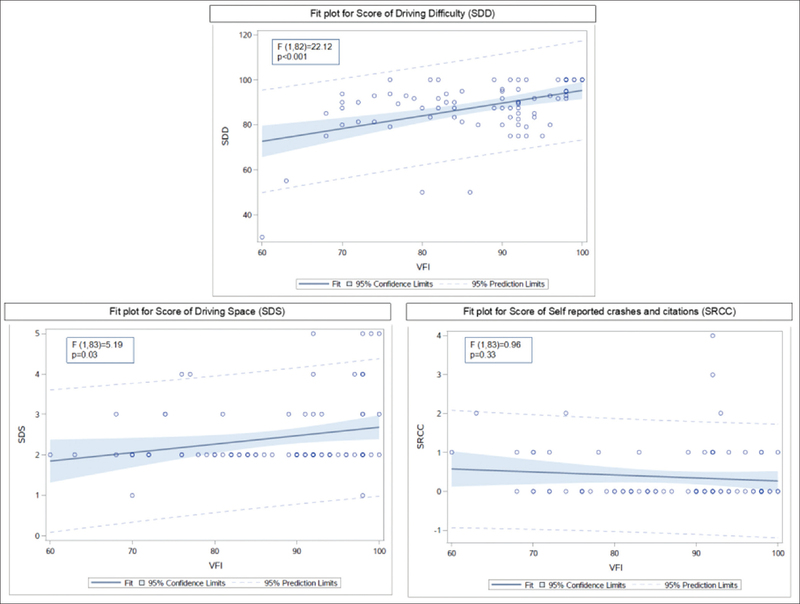 SAS version 9.2 (GLM procedure) was used in linear regression analysis between VFI and driving difficulty, score of driving space, and self-reported crashes and citations. Thirty-nine patients had no associated systemic illnesses, and 61 had associated systemic illnesses, such as diabetes mellitus, bronchial asthma, hypothyroidism and systemic hypertension. All 100 patients had a valid Indian DL. Twenty-six patients had a license to drive a two wheeler, 25 had a license to drive a four wheeler, and 49 patients had both two- and four-wheeler license. The average duration of holding the DL was 30.91 years (range, 10–52 years). All patients had at least one renewal of their license. Medical certification during license renewal (vision-related) [Table 1]: Forty-three patients did not submit Form 1 (self-declaration) during the renewal process. Sixty-one patients submitted a medical certificate (Form 1A). The undersigning doctor in the medical certificate, when it was issued, was a registered general medical practitioner in 55 patients and an ophthalmologist in six patients. Only 18 patients had their visual acuity and color vision checked prior to certification. Four patients had further medical examinations related to general health, such as systemic blood pressure and pulse, prior to certification. Forty-five patients bypassed parts of the renewal procedure and obtained the license with some help from the regional transport office (RTO) personnel. Only 4 patients out of 100 declared that they had glaucoma in Form 1/Form 1A. Eighty-four patients were currently driving and 16% (n = 16/100) of patients had stopped driving. Of the persons who had stopped driving, 31.25% (n = 5/16) were because of self-reported ocular causes. Nine patients had stopped because of non-ocular causes such as old age, vertigo, or orthopedic causes, and two had both self-reported ocular and non-ocular causes. Patients who had stopped driving were shown to have higher relative probability (relative probability = 1.12) of having failed on the visual field criteria (odds ratio = 1.73). Of the 100 patients who had a valid license, only 1 would have failed the Indian criterion as he had visual acuity (corrected) <6/12 in both eyes. 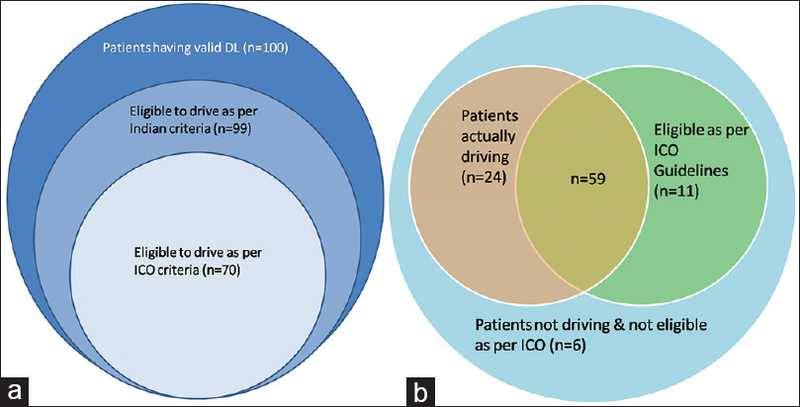 If the International Council of Ophthalmology (ICO) guidelines for driving eligibility were applied, 70 patients would be eligible to drive, and 30 would not be eligible to drive [Figure 1]. The 84 patients who were currently driving were administered the DHQ questionnaire. Of these, one patient had recently stopped driving, but answered two domains of the DHQ pertaining to driving space and crashes and citations, as he had driven for much of the last year. The results of the DHQ questionnaire in the five domains are summarized in [Table 2] and [Table 3]. 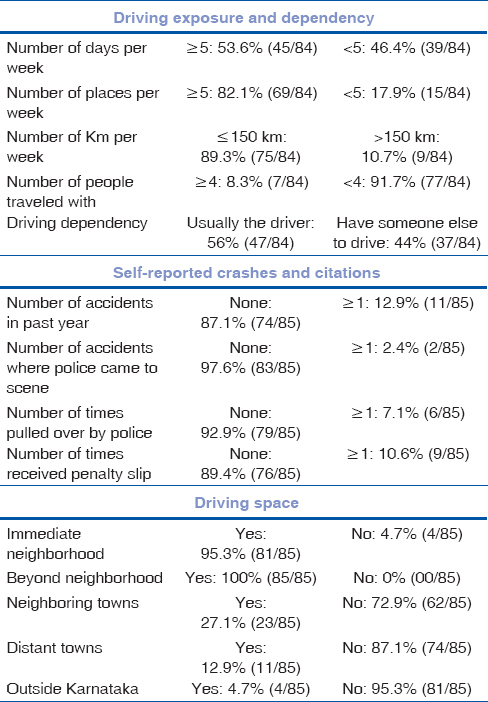 Seventy-two percent (61/84) had restricted their driving to neighborhood and were not driving outstation. However on linear regression calculated to predict restriction of driving space based on VFI, a less significant regression equation was found (F (1, 83) = 5.19, P = 0.03). Seven items in driving difficulty domain ask patients to rate the degree of visual difficulty experienced in specific driving situations. Ratings are made on a 5-point scale (5 = no difficulty, 4 = a little difficulty, 3 = moderate difficulty, 2 = extreme difficulty, 1 = so difficult that I no longer drive in that situation). 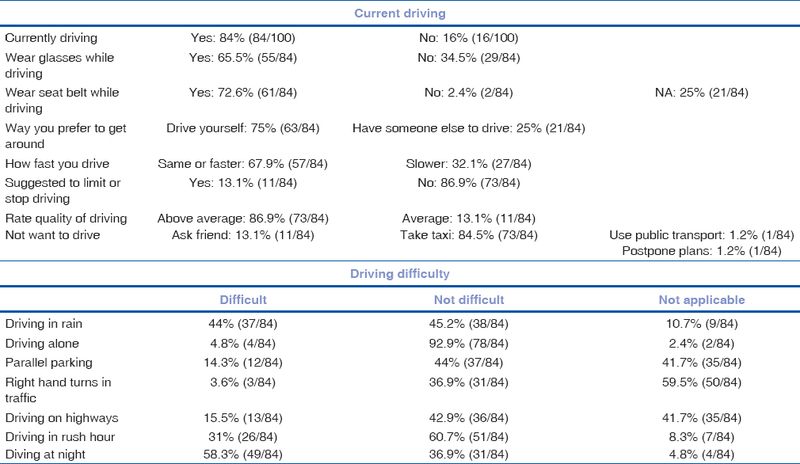 A composite score of driving difficulty was computed based on the responses to all the items in domain and scaled on a 100-point scale [(mean score − 1) × 25]. Lower composite scores indicate a greater degree of difficulty. Forty-four percent (n = 37/84) of patients had composite score of <90. For the purposes of analysis, composite difficulty score that ranged from 0 (extreme difficulty) to 100 (no difficulty) was used. A simple linear regression was calculated to predict score of driving difficulty based on VFI. A significant regression equation was found (F(1, 82) = 22.12, P < 0.001) [Figure 2]. Eleven out of 85 (12.9%) patients met with less than equal to one crashes in 1 year. The composite score of crashes and citations in the past 1 year, which also includes number of accidents when police came to the scene, number of times pulled over by police, and number of times received penalty slip, was not significantly correlated with severity of glaucoma (F(1, 83) = 0.96, P = 0.33). History of previous glaucoma surgery was not significantly correlated with poor performance on any of the domains of the DHQ. In India, all matters related to driving and licensing are presently regulated by the Motor Vehicle Act (1988) (IMV) and the Central Motor Vehicles Rule (1989). An amendment to the Motor Vehicle Act was also passed in 2017. Issuing of DL is a state matter in India, and the RTOs are the licensing authority. The IMV Act prescribes visual acuity criterion for eligibility to drive but does not specify any visual field criterion. As per subsection (3) of Section 8 of the Motor Vehicle Act 1988, a self-declaration for non-transport vehicles and a medical certificate from a RMP in case of transport vehicle are sufficient for the grant of learner's license in India. Ocular diseases such as glaucoma, which could affect the visual field, should be either self-declared by the patient or mentioned by the doctor in the medical certificate. The act also mandates that the DL should be renewed after 20 years of the initial licensing, and at this renewal too, the same requirements for visual certification are followed. The amendment to the act (2017) does not change any of these visual requirements for licensing. Binocular visual field should be at least 120° horizontal and 40° vertical, evenly divided on either side of fixation point. Contrast sensitivity is recommended but the current absence of a simple screening test, which can be applied, makes it an important option for the future. The comparison between Indian and ICO criteria is given in [Table 4]. As per the Indian criteria, RMP should declare if applicant can distinguish motor car plate in day light at a distance of 25 m. He should also declare about night vision and color vision. All other aspects are either to be self-declared or attested by the RMP. No cutoff for visual acuity or visual field criteria is prescribed. In our study, if the ICO-recommended guidelines were applied, 30 patients would not have had the license. In addition, if Indian criteria were correctly applied, four of our patients would not have been eligible to drive. This was because they bypassed the testing process before renewal. It is also seen that 45 patients had not gone through the prescribed process and bypassed the medical part of the renewal procedure. Our study clearly shows that the likelihood of patient self-declaring glaucoma is low, and most of the times a RMP, rather than an ophthalmologist, ends up certifying the patient. In a study done by Verma et al. at Guwahati, India, 5% of drivers had tunnel vision, 7% failed in the glare recovery test, and 15% of drivers had unacceptable visual acuity. Five percent of drivers had problems with color vision and night vision. Poor performance was also demonstrated in all these parameters, in drivers, and in a study by Chakrabarty et al., from Delhi, India. They also go on to recommend a comprehensive vision assessment system for licensing. The time of renewal of the license provides a golden opportunity to screen for many chronic age-related disorders including glaucoma. Visual field screening can detect many ocular diseases apart from glaucoma. We agree that driving safety not only depends on what is seen but also as to how quickly and adequately drivers respond. It should be stressed that driving is a privilege, not a right and the primary responsibility of those who assess potential drivers is to the public and not to the applicant. In this respect, Indian criteria need to be well defined and need to be properly implemented. It is also important to note that self-regulation by patients by either stopping to drive or by limiting their driving to neighborhoods occurs in the setting of visual morbidity because of glaucoma, as shown in our study. In addition, incidence of crashes/citations, in our study, did not correlate with severity of glaucoma. This is demonstrated in other studies as well., This may be because glaucoma patients are more aware and may be more careful while driving. Limitations of the study: Our study was limited to an urban metro setting, which cannot be generalized to all areas. All patients drove only non-transport vehicles. The implications of driving transport vehicles are not explored in our study. Our study has a male preponderance because of the societal context in our country in the age group of 40–70 years. This is likely to change in the coming years. We have not tested contrast sensitivity, and glare sensitivity, as well as night vision, which are also important aspects of visual requirements for driving safety. Lack of an easily available standardized test for these is a contributory reason. Esterman/binocular visual field testing was not done in our patients. This is because of the published articles, which recommend the superiority of threshold visual testing in this context. A binocular test could further establish the extent of the visual field in the light of the ICO recommendations. Vision-related testing at the time of renewal of DL is inadequate in India. Chronic eye diseases such as glaucoma are commonly not self-declared or detected at the time of pre-renewal testing. Testing of persons aged 40+ for visual certification should be preferably done by an ophthalmologist. Clear-cut guidelines about visual requirements and proper implementation are required to prevent road traffic events because of vision-related driving error and could provide an opportunity to screen for glaucoma. Owsley C, McGwin G Jr. Vision and driving. Vis Res 2010;50:2348-61. Freeman EE, Muñoz B, West SK, Jampel HD, Friedman DS. Glaucoma and quality of life: The Salisbury eye evaluation. Ophthalmology 2008;115:233-8. Tanabe S, Yuki K, Ozeki N, Shiba D, Abe T, Kouyama K, et al. The association between primary open-angle glaucoma and motor vehicle collisions. Invest Ophthalmol Vis Sci 2011;52:4177-81. Rubin GS, Ng ES, Bandeen-Roche K, Keyl PM, Freeman EE, West SK. A prospective, population-based study of the role of visual impairment in motor vehicle crashes among older drivers: The SEE study. Investigat Ophthalmol Vis Sci 2007;48:1483-91. McGwin G, Xie A, Mays A, Joiner W, DeCarlo DK, Hall TA, et al. Visual field defects and the risk of motor vehicle collisions among patients with glaucoma. Invest Ophthalmol Vis Sci 2005;46:4437-41. Vijaya L, George R, Arvind H, Baskaran M, Ve Ramesh S, Raju P, et al. Prevalence of primary angle-closure disease in an urban south Indian population and comparison with a rural population. Ophthalmology 2008;115:655-60.e1. 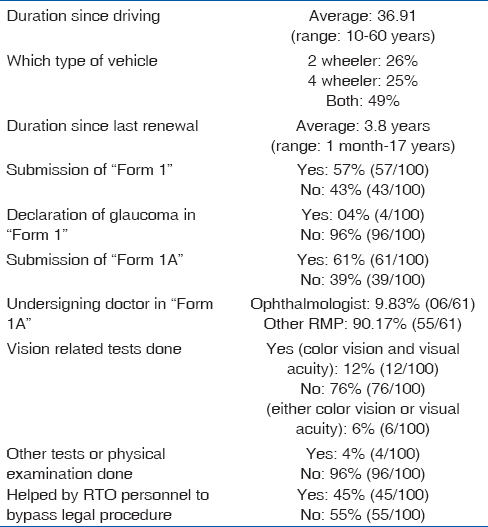 Ayala M. Comparison of the monocular Humphrey visual field and the binocular Humphrey Esterman visual field test for driver licensing in glaucoma subjects in Sweden. BMC Ophthalmol 2012;12:35. Hirasawa K, Shoji N, Morita T, Shimizu K. A modified glaucoma staging system based on visual field index. Graefes Arch Clin Exp Ophthalmol 2013;251:2747-52. Owsley C, Stalvey B, Wells J, Sloane ME. Older drivers and cataract: Driving habits and crash risk. J Gerontol A Biol Sci Med Sci 1999;54:M203-11. Colenbrander A, De Laey JJ. Vision requirements for driving safety with emphasis on individual assessment. Report prepared for the International Council of Ophthalmology at the 30th World Ophthalmology Congress. Sao Paulo, Brazil, February 2006. Available from: www.icoph.org/pdf/visionfordriving.pdf. McGwin G, Mays A, Joiner W, DeCarlo DK, McNeal S, Owsley C. Is glaucoma associated with motor vehicle collision involvement and driving avoidance? Invest Ophthalmol Vis Sci 2004;45:3934-9. Ramulu PY, West SK, Munoz B, Jampel HD, Friedman DS. Driving cessation and driving limitation in glaucoma: The Salisbury eye evaluation project. Ophthalmology 2009;116:1846-53. Crabb DP, Viswanathan AC. Integrated visual fields: a new approach to measuring the binocular field of view and visual disability. Graefe's Arch Clin Exp Ophthalmol 2005;243:210-6.